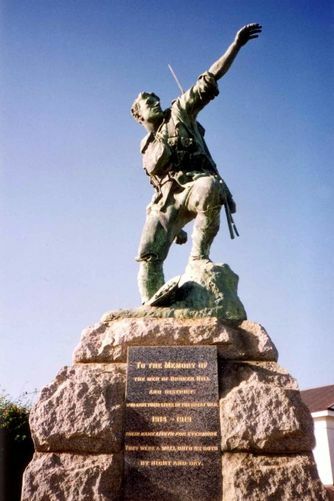 A sculptured bronze war memorial entitled "The Bomber" by artist Charles Web Gilbert commemorates the men from Broken Hill and District who died in service or were killed in action during World War One. Charles Web Gilbert died a week before the unveiling. The sculpture is of a soldier in combat which is different from the usual reflective monuments in Australia. Lieutenant-General Sir John Monash, who had been corps commander of the Australian forces, visited Broken Hill and at a 'smoke' social given in his honour by returned soldiers, expressed his surprise that no war memorial existed in Broken Hill given that so many men from the town and district had enlisted for active service. Those present at the meeting decided that steps should be taken to erect a monument and the Mayor, Alderman J. H. Wicks, convened a public meeting following which a memorial committee was formed. When the design became public it created a controversy, many citizens expressing the opinion that it was unsuitable, being too "brutal", "boastful", "challenging" and "warlike". Conflicting opinions were aired in newspaper editorials and letters to the Editor but the decision had been made and the commission accepted. Approval was received from the Attorney General for erection of the memorial in the grounds of the court house on land given by the government of New South Wales. On Sunday Sír John Monash will unveil the Broken Hill and district war memorial at half past 2 o`clock. The memorial is at the corner of Argent street and Sulphide street. It is a monument of Harcourt granite, and the main feature is the figure of an Australian soldier in the act of throwing a bomb. Four bronze tablets contain the names of 365 men who volunteered from the district and were killed in action. The bronze figure was cast from the clay model designed by the late Mr C. Web Gilbert. The Argus (Melbourne), 7 October 1925.